The FXCharger is a forex expert advisor. The FX Charger automated forex trading software for the MetaTrader platform has been forward tested on a live account by the Forex Peace Army. 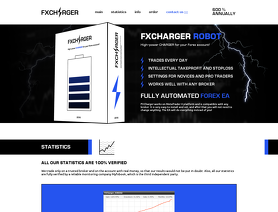 The FXCharger.com forex robot works with EURUSD, AUDUSD. Trade with FXCharger EurUsd, deposit $ 1000 , ICMarkets-Live05, Lev 1 : 500 , since Aug 2017 till now, result 128.1 %. FXCharger AusUsd, deposit $ 880 , FXCL , Lev 1 : 500, since Oct 2018, result 36,5 % . I do not know in future, but at least I got profit from this EA up to now. Quick respond author. Fraud, a liar company. 5 days ago i bought it on the forexstore.com . Thither are written , that 30 day warranty for the Ea , i wrote that the robot did margin call on the demo account , he's wrote this is not enough for a refund. I question what the warranty applies to??? If i could not give an asterisk. Nobody take the https://forexstore.com/ page for anything. Company fraud and criminals. Does not live up to expectations. One star because there is nothing less. After much too and fro with after the purchase and a lack of performance by the EA, even with default settings, I have given up and consigned the EA to the bin. Money not well spent I'm afraid. Other reviewer is right that this company and other sites own by this EA developer are luring people in by fake 30 day money back guarantee. 1- the fxcharger trade on margins consequently this ea work if the market is ranging.